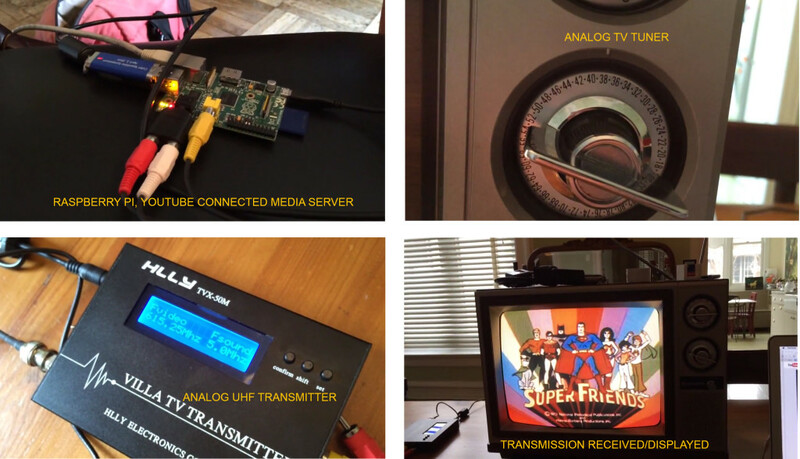 An analog TV broadcast network was built with a Raspberry Pi and a 5 milliwatt TV transmitter for the interactive Console Living Room exhibit at the University of Mary Washington, April 2015. The Console Living Room is an exhibit featuring technology and media from the mid-1980s situated in a simulation of a living room setting in 1985. Located in the fourth floor of UMW’s Information Technology Convergence Center, the living room recalls or reenacts the domestic convergence of consumer media technology. By making these games available in a public space, we are inviting students, guests, and the community to visit and interact with an earlier time. As part of a visit to the exhibit I also had the opportunity to give a talk and work with classes at the university. Students created a variety of animations inspired by the aesthetics of the objects and media. They are a dancing banana, a moment in a Stanley Kubrick film, a reaction that says how you feel, or a near miss death defying experience – all repeated endlessly. Sometimes they pause to let you reflect on a moment and sometimes they they move so fast and brightly, they come with seizure warnings. They are bits of internet ephemera shared a million times over in dozens of social media networks and they are an emergent art form selling for real money. They are 256 colors per frame. They are animated GIFs.